In recent years, sustainable design has begun to creep into the mainstream, as millions around the globe have discovered the cost-effectiveness of environmentally conscious design. However, despite much progress, there is still much that can be done at home to save electricity, heat, water, and improve our indoor air quality, much of which can be done in our own bathrooms. Below are six tips for saving money by conserving energy in one of the most widely used rooms in every house. When bathrooms are used, they will have bad smell! Now you can get rid of them with Smelleze® Reusable Toilet Smell Deodorizer Pouches. 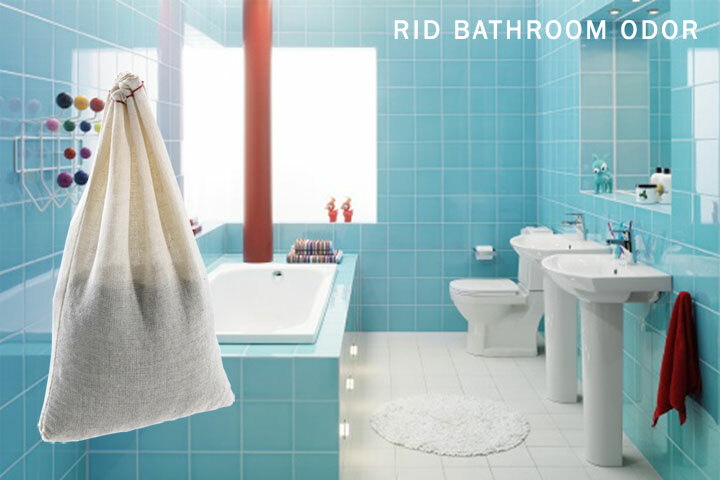 All you have to do is place these discrete eco-friendly pouches in your toilet and they will go to work absorbing and eliminating odor 24/7 without the use of any power or using harmful fragrances. They are also reusable so they will last for years and save you money. We are all familiar with these from public restrooms at any number of businesses. However, these faucets are now available in homes too. Leaving water running while shaving or brushing teeth can waste as much as four gallons per minute, and as much as we try, even the most conscientious among us can fall into old habits and leave the tap running. Traditional-model toilets typically use anywhere between 1.6 and 3.5 gallons of water per flush. Low-flow, or high-efficiency toilets only use about 1.3 gallons per flush. Australia, the world’s driest continent, has recently begun implementing dual-flush toilets. These toilets offer users two buttons, one for flushing liquid waste, which uses only 0.8 gallons of water, and another for solid waste, which uses 1.6 gallons. Conservation experts assert that by switching to these high efficient toilets, consumers can save upwards of 3,200 gallons of water per year and as much as $100 per year in utility costs. A long hot shower is one thing many people refuse to part with, but even this luxury doesn’t necessarily require a great deal of energy use to enjoy. Traditional water heaters keep 40 to 80 gallons of water heated to 120 degrees or higher all day, every day, raising the heating costs of a home substantially. However, tankless water heaters provide hot water only when needed, heating water on demand. Once the hot water tap is turned on, the system rapidly heats cold water, which continues flowing as long as needed. While the units cost more upfront, The US Department of Energy asserts that homes using 41gallons or less of hot water daily can save 24% to 34% on energy costs by switching to tankless heaters. The units are also often eligible for federal tax credits. Speaking of hot water, energy can also be wasted as water is transported from the heater to its eventual destination. Water pipes often run through uninsulated areas like basements and walls where heat is quickly lost. This lost heat translates to greater energy usage to ensure the water remains warm on its way to the shower head or faucet. This issue can be handled with relative ease by insulating all hot water pipes across their entire length from the water heater to the end fixture. While energy conservation is almost always a good investment, not all energy-efficiency measures necessitate high upfront costs. The Drip Accumulator on the US Geological Survey Website allows users to discover how much their leaky faucets are costing them over time. For instance, a home with three faucets dripping once per minute was found to waste over 100 gallons per year. Regular maintenance of a home’s faucets, toilets and pipes can provide excellent long-term value. While some of these are easier to implement than others, all will result in notable savings for any homeowner. At a time when we all could stand to save money, these solutions also serve to positively impact our planet at a time when resource conservation is more important than ever. James Numbers is a professional blogger that provides consumers with information on storage tanks and equipment, He writes for National Tank Outlet, where you can be the best bruiser tanks, custom fabricate storage tanks among many other storage containers.